Professor Yu Yongding is, in short, an Academician of the Chinese Academy of Social Sciences (CASS), Editor-in-Chief, China and World Economy (1998- ), Member of Advisory Committee of National Planning of the National Development and Reform Committee of the PRC (2004- ), Member of Advisory Committee of Foreign Policy of the Ministry of Foreign Affairs of the PRC (2010- ), and he was, inter alia, Member of the Monetary Policy Committee of People’s Bank of China (2004-2006) and President of China Society of World Economy (2003-2011). Let’s take a look at his opinion on gold. 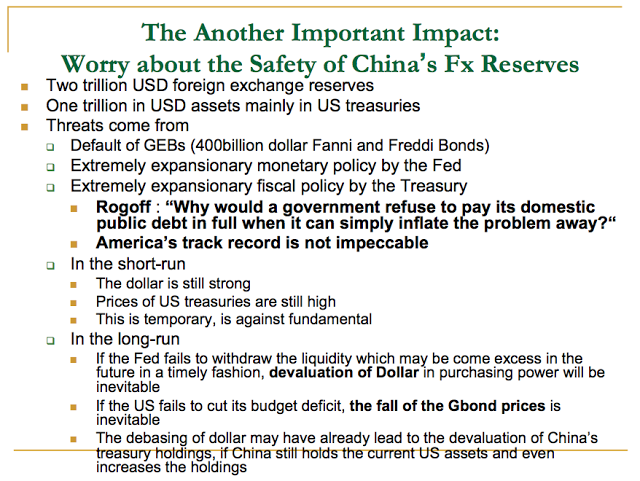 China has more than enough foreign-exchange reserves. While they cannot be reduced sharply all at once, China has decided to take measures to curb their growth rate and diversify investment of its reserves. 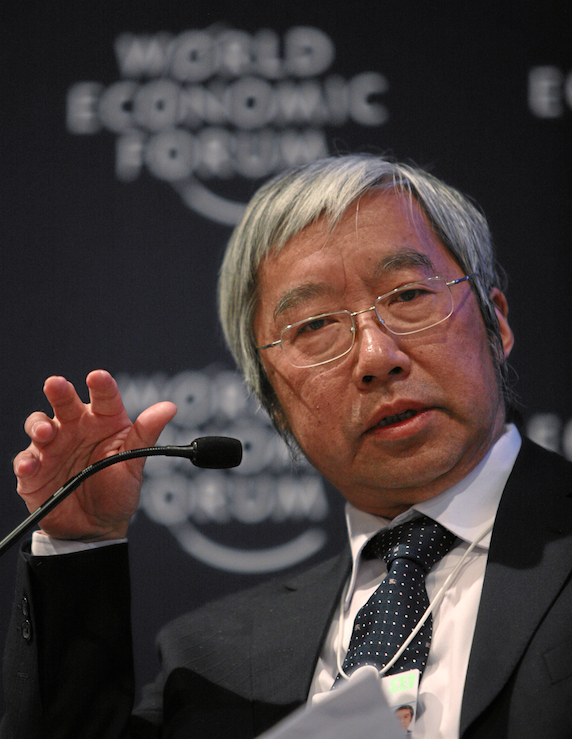 ..We don’t want to cause dramatic fluctuations in the foreign-exchange and securities markets. China needs to establish a separate body to oversee and invest the reserves to seek higher returns and to avoid losses in case of a big depreciation in the U.S. dollar. ..We need to use some of the reserves to buy other assets such as gold and strategic resources such as oil. 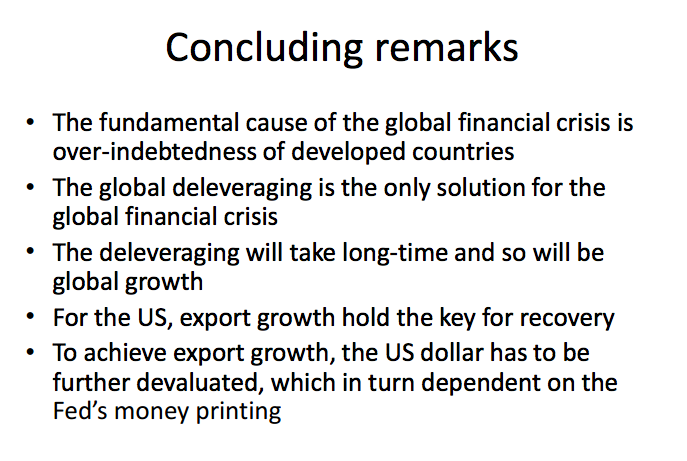 ..devaluation of Dollar in purchasing power will be inevitable. What can China do? 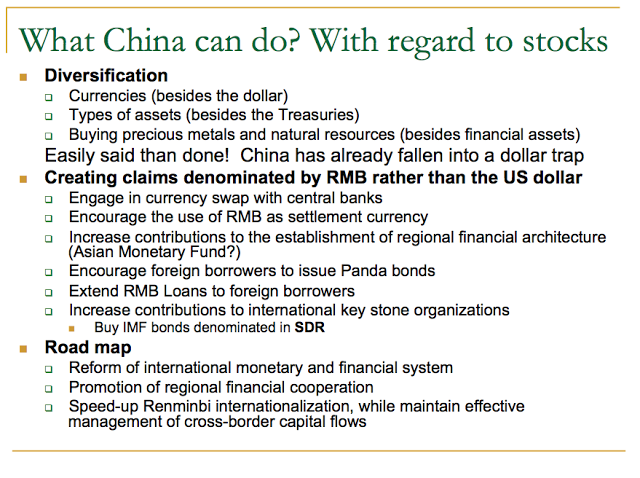 Buying precious metals and natural resources (besides financial assets). Easily said than done! 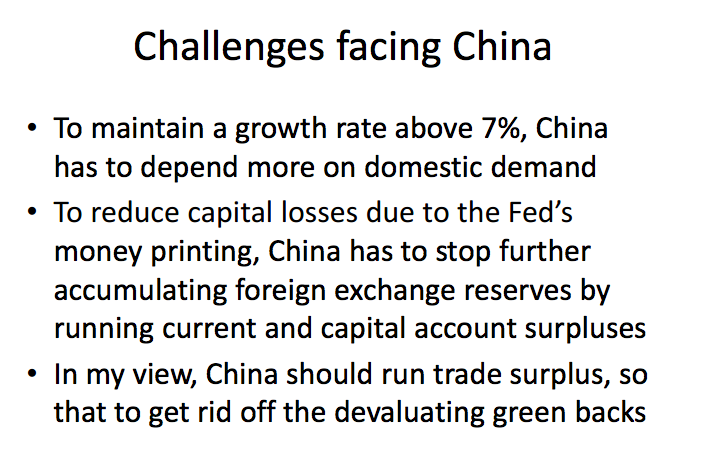 China has already fallen into a dollar trap. Due to China’s huge forex reserves, it’s difficult in the short term to make gold a main channel to accumulate forex reserves like the US and European countries have accumulated. It’s especially true that as global gold prices make new highs, increasing gold reserves also becomes more difficult. A very low USD price of gold for a substantial period would help China enormously in diversifying, which is exactly what is happening in 2013; the price of gold has been down since April and China has been able to buy unprecedented amounts of gold. Lucky China, maybe they opened the right fortune cookie. – To create inflation. Before taking over the Presidency of the Fed, Bernanke was very open in talking about the possibility of using inflation to solve the debt problem. He gained the very apt nickname ‘Helicopter Ben’, and I think he will rule out this option, but of course he will not say so openly. 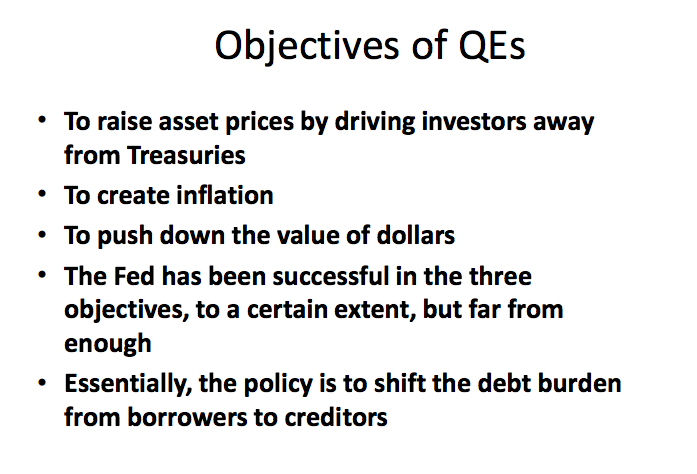 – To push down the value of the dollar is another very important objective of QE, even though Bernanke refused to admit that this is the policy, but I think Greenspan is more honest, because he is no longer the governor. Essentially, the policy of QE is to shift the debt burden away from borrowers at the expense of creditors and I think this is basically the situation that China is facing.